Are you taking care of the kids while your spouse is away at work? 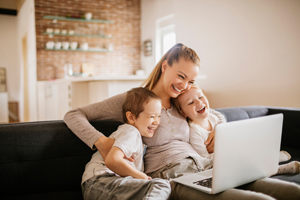 Being a stay-at-home mom might be a necessary role for your family, but it can be an exhausting job and unfortunately, it doesn’t help you pay any of the bills. Wouldn’t it be nice if there were home business opportunities that fit in with your responsibilities of being a stay-at-home mom? Luckily, there are with Kaeser & Blair Promotional Products. Kaeser & Blair is one of the best home business opportunities because they are a direct sales company that lets you be your own boss. For a one-time, minimal start-up cost of $85, stay-at-home moms can become business owners. Now, if the title “Business Owner” intimidates you, then just know it shouldn’t. Your main duty as a Kaeser & Blair Business Owner will be to sell promotional products – things like a pen or ball cap with a company or organization’s logo on it. Kaeser & Blair differs from other home business opportunities because we won’t ask you to buy or maintain any inventory. Don’t worry about finding a place in your home to store your customers’ promotional products or hiding boxes from your children. Kaeser & Blair takes care of invoicing and money collection, plus we send orders directly to your customers. To put it simply, Kaeser & Blair’s home business opportunities make it possible for you to be a business owner AND a mom. Now, you may be wondering if the $85 dollar start-up cost only provides you with a fancy new title. The answer? Of course not! Kaeser & Blair’s low cost to start one of their home business opportunities grants you with a Standard Business Owner Package. In this package, you’ll receive all the necessary tools to become a successful business owner. Some of these tools include online training assets, a large assortment of our best selling product samples, and our Best Buys Catalog, which has more than $100,000 in promotional products sold from it every day! Plus, we’ll refund your $85 investment once you reach your first $1,500 in sales. If you decide our home business opportunities aren’t for you then you can return the package within 30 days to receive a full refund. Lastly, by taking part in Kaeser & Blair’s home business opportunities, you are put in control of your schedule and how much money you’ll make. You truly get to be your own boss as you determine how much effort you put into selling promotional products. If you’re only considering home business opportunities to afford a new designer handbag and some jewelry, then you could just work a few days a week whenever you have time away from the kids. However, if you wanted to turn one of our home business opportunities into a career, then you could start working from home full time. Basically, the more you work, then the more sales you should be making. And with gross profit margins up to 65% on each sale, you’ll find yourself with generous earning potential. Are you ready to become a stay-at-home mom who also makes great money? Order a Standard Business Owner Package today to get started.